The converters take power from the tail light circuit and converts it to 24 volts. That 24 volt power is fed into relays that are triggered by the left and right stop/turn circuits. The 24 volts from the power converter and relays are fed to a 12-Pin NATO socket. The semi-trailer versions have additional relays that provide turn and stop lighting for military semi-trailers without adding or modifying the trailers lights. The adapter will supply a total of 10 amps (240 watts) for trailer lighting. The standard taillight bulb draws 26 watts for stop/turn and 8 watts for tail. A typical trailer setup of two stop/turn/tail light bulbs (one per side) with running lights on and brakes applied will use 68 watts, leaving 172 watts for marker lights (they tend to be 8 watts or less). A maximum of 20 amps is drawn from the tow vehicles tail light circuit by the adapter. 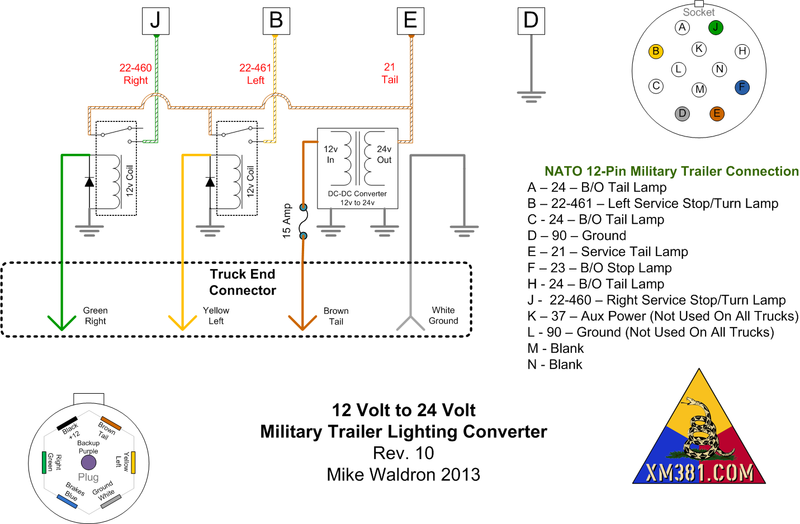 Most military trailers have a permanently attached NATO lighting cable that plugs into the tow vehicle, but semi-trailer variants often use an "intravehicular cable". 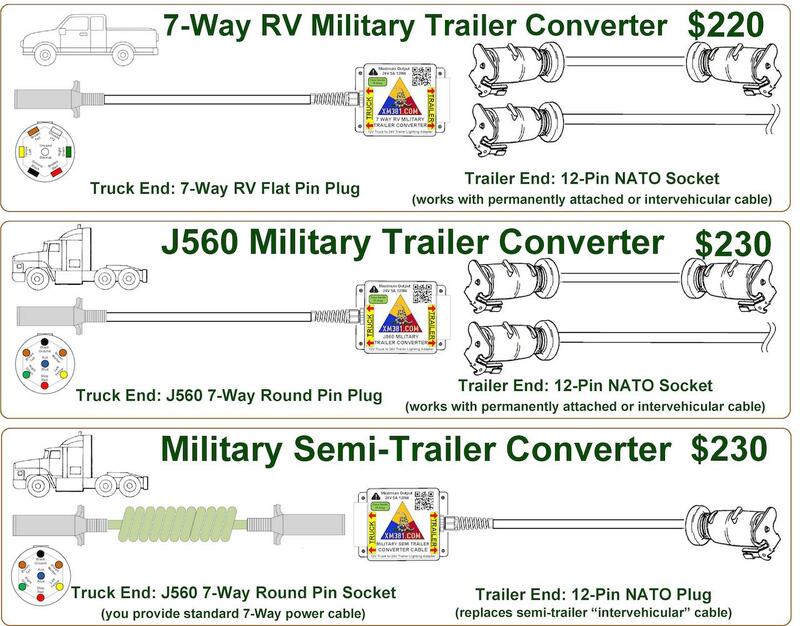 The "7-Way Military Trailer Converter" is for pulling a military trailer with a tow vehicle that has a 7-Way RV style socket, like a pickup truck. The "J560 Military Trailer Converter" is for pulling military trailers that have a 12-Pin NATO trailer cable attached to them, or a military semi-trailer "intervehicular cable", with a tow vehicle that has a J560 7-Way Round Pin socket, like a semi tractor. The "Military Semi-Trailer Converter" is for pulling military semi-trailers, that typically use an "intervehicular cable", with a tow vehicle that has a J560 7-Way Round Pin socket, like a semi tractor. Use a standard J560 coiled power cable to connect the tractor to the converter. This converter is used in place of the intervehicular cable and plugs into the NATO socket on the front of the semi-trailer. Just plug it in! Plug the adapter's 7-way RV style plug into the tow vehicle's socket. 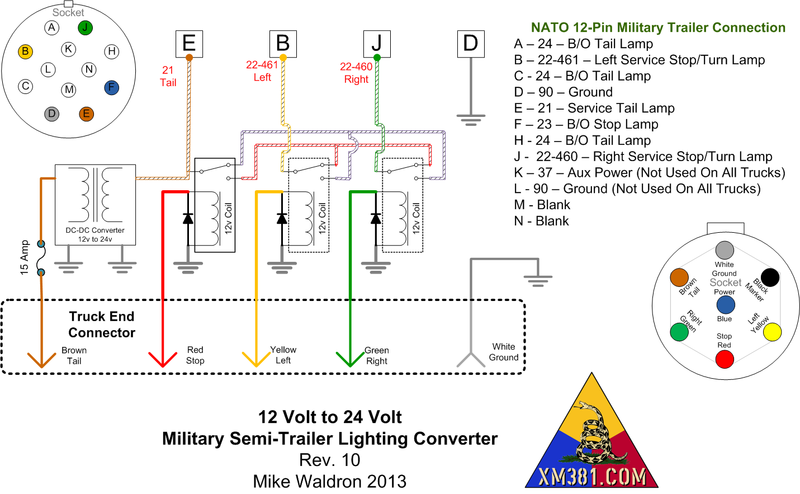 Plug the military trailer into the adapter's 12-pin NATO socket. Just plug it in! Plug the adapter's J560 plug into the tractors socket. 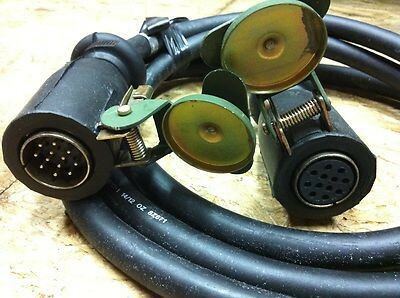 Plug the military trailer's cable into the adapter's 12-pin NATO socket. Just plug it in! Connect a standard coiled power cable from the tractor to the adapter. Plug the adapter's 12-pin NATO plug into the military trailer's NATO socket.